Behind the Mic—Guest Michael Chamberlain – Welcome to the 2019 Beemie Awards! 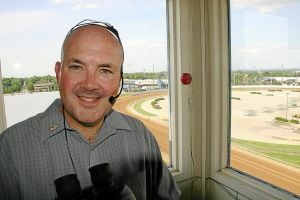 Michael Chamberlain is the voice of racing at Turf Paradise in Phoenix, Arizona. Michael spent a dozen years at Sam Houston and is a popular race caller not just among fans, but among us rooftop dwellers as well! MC: Caught the bug watching the big races on TV as a kid. I am old enough to remember seeing Ruffian, who I fell in love with like everyone else. I was a big fan (and still am) of Chic Anderson, who called all the big races back in the day. I still think he is the best announcer ever. It was just great timing for me also because I really got into Seattle Slew and Affirmed when they were going after their Triple Crowns. MC: My first race call came at Turf Paradise while I was working for a sports-radio station in Phoenix. I had my press pass to the track and was kind of bugging everyone in the press box about becoming an announcer. I would bring my binocs out to the track and stand on the balcony and call the races, pretty terribly. We all decided it would be kind of fun for “Radioboy” to call a race and make a fool of himself, so I started to intensify the practicing and actually made a decent pass of the race call. It was a three-horse photo in a six-horse field. I remember the #6 horse won the photo, but I don’t remember his name. My mother and some of her friends came out to the track that day to hear me and it definitely convinced me that this was what I wanted to do. What do you remember about the day you got the offer for your first full-time announcing gig? MC: My first full-time announcing job was at Sam Houston Race Park. In November 1996, I flew down to Houston and called a weekend’s races. They were having “Announcer Of The Week” auditions and I ended up getting the job. The coolest part was that I got the phone call from the racetrack giving me the job in the middle of the Jacksonville Jaguars’ playoff upset over the Denver Broncos that year. So, while I am a devout fan of the San Diego Chargers, the Jaguars are my 2nd favorite team. Always will have a soft spot for them. You were the race caller at Sam Houston for a number of years. What are some of your favorite memories from that track? MC: I mentioned that I don’t remember the name of the winner of the first race I ever called, but I do remember the name of the horse that won the first race I called as an “Official Announcer” at Houston: Plain World. I got to have many cool experiences working at Houston. I went to three All-Star Announcers Days at the Breeders’ Cup, calling a race at Arlington, Lone Star, and Churchill Downs. I was the voice of the NTRA Great State Challenge in 2002 at Houston and got to call what amounted to a public workout by Take Charge Lady. Candid Glen won three John Connally Breeders’ Cup Turf races in my time there. The most important thing, though, are the relationships I forged working there. My boss there, Martha Claussen, is still a great friend and a close confidant for me. We always had so much fun tweaking each other (and Dr. Reid McLellan) during our Triple Crown or Breeders’ Cup seminars. One of my best friends, Chris Meeks, is someone I met while working at Houston. I was there 12 years and most of it was a great time in my life. We all have memories of the great Luke Kruytbosch, what are some of your fondest memories of Big Luke? MC: I wouldn’t be where I am today or have had any of the opportunities I have had without Luke Kruytbosch. I am always proud to say he was my mentor and my friend. I remember the first time I ever called a race with him in the press box. To say I choked is putting it mildly. I’m sure he thought he wouldn’t see me again, but I kept coming back and working hard and when he saw how dedicated I was, he really made sure I got a chance to get a good tape together. If I went out on a day when he knew no one was around at Turf in the offices, he would ask me if I wanted to call one that day. He was the one who told me about the chance to go try out for the job in Houston. After I got the Houston job, I’d make sure to call him once a month and just talk with him, laugh with him, make sure he knew what was going on. I still have a picture we took in the old booth at Churchill Downs in 2001. I still miss Luke terribly. Most of us have had to move quite a bit to pursue this dream. Is the travel something you like or tolerate? How many times have you had to move? MC: I didn’t have to move around at all during my time in Houston, which was fortunate. Since coming back to Turf Paradise, I have had to have summer work. My first three summers were in Lincoln, Nebraska at the now-defunct Lincoln Race Course. That was such a fun place and Lincoln was just a great town to get to spend the summer in. I became very good friends with Rob Tuel, who I worked closely with there on the pre-race handicapping show. After Lincoln closed, I went to Fair Meadows in Tulsa last summer and worked with a former Houston co-worker, Richard Linihan. Starting this summer (and hopefully for many more), I will be going to Vernon, NY and calling the harness races at Vernon Downs. I am tremendously excited for this new opportunity. The first racetrack I ever went to was Yonkers Raceway, so the harness races hold a special place for me. I can’t wait to get there and get started. I actually think seeing different parts of the country is fascinating. We often end up announcing things other than horses (weiner dogs, camels, etc), what are some of the weirder things you’ve been asked to call? MC: Weiner dog races, camel races, ostrich races, pie-eating contests. I even had to call the Hooters Girl Olympics they held at Sam Houston once. On a sloppy track no less. In 2014 you’re gifted with a “Call Any Race You Want card” where you can cash it in and get to call that race. What race would you cash it in to call? MC: While it has always been my goal to announce a Breeders’ Cup, if you say I have a card like that, I would have to say I would love to call a Belmont Stakes with a horse having the chance to win that elusive Triple Crown. Are you a handicapper? If so what is one of your memorable picks or scores at the windows? MC: Yes, I am a handicapper. While my Kentucky Derby exacta score on my birthday numbers has acquired a legend on its own (EDITORIAL NOTE: Michael’s birthday is August 16th, so when Mine That Bird won as the number 8 horse and Pioneer of the Nile ran second as the number 16, Michael took home over Two Grand by just playing his birthday numbers!!) , I am very proud of two scores I have had in Phoenix, one at the windows and one not. I loved Turallure in the Breeders’ Cup Mile at Churchill Downs in 2011. I had played him in exactas over ALL and ALL over him. So, when the result ended up being Court Vision (2nd biggest longshot to win a BC race) over Turallure, I happily cashed that $1 exacta play for just over $1,000. The other score I enjoyed was winning an Equibase Handicapping Contest outright when Pants On Fire scored a surprise win in the 2011 Louisiana Derby. His win vaulted me to first place and $500. But, it was more important to win the contest to me. If I find myself at Turf Paradise, where are you sending me after the races to have a great dinner? And don’t say Whataburger! MC: After a day at the races at Turf Paradise, I will send you to La Fonda Del Sol in Scottsdale. It is without a doubt the best Mexican food I have ever eaten. I always order the shrimp fajitas. In fact, the last few times I went there, my waitress recognized me and called me “The Fajita Man”.